I had a great time yesterday as a guest reader for Reading Week at Rhodes School, just a few blocks from my house. 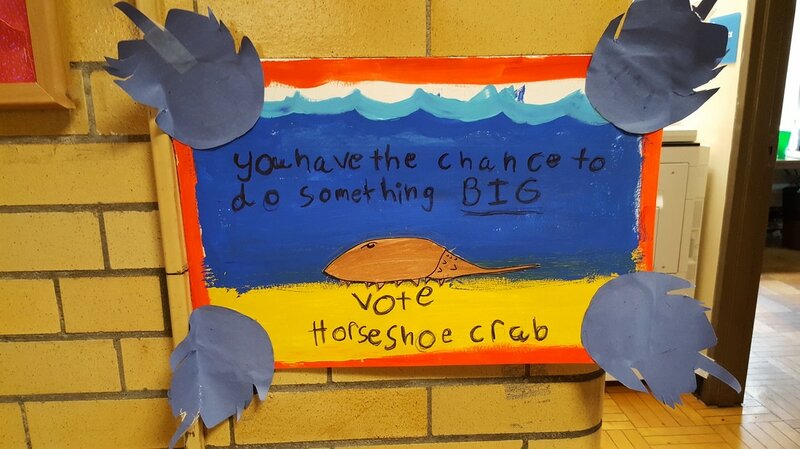 This school just voted to adopt the horseshoe crab as its mascot, and some of the campaign posters were still on the walls. The whole school had already read Crab Moon, but they didn't seem to mind hearing it again, from the person who wrote it. 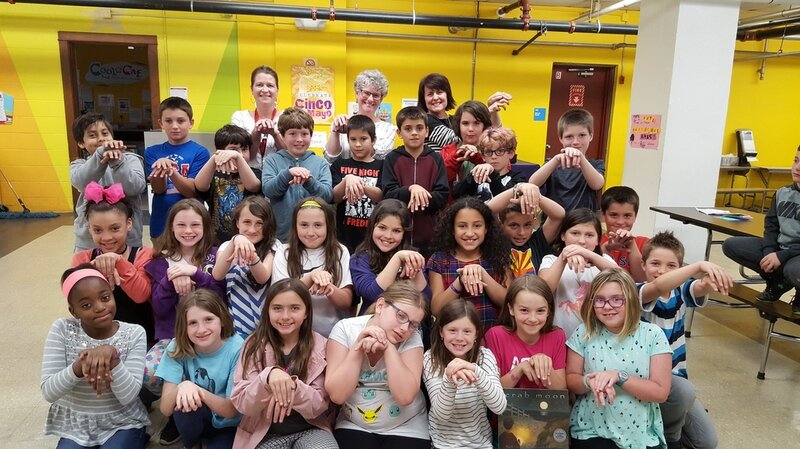 The older kids (3rd-5th grade) taught me some things about horseshoe crabs, and I told them things about what goes into turning an idea into a book. I read Crab Moon and Are We Still Friends? to the Kindergarten-2nd graders. We had a great conversation about apologizing and accepting apologies, and about sometimes the right word can be stronger than a tall wall. I'm so grateful for the work these teachers are doing, and so glad to have had a chance to meet these wonderful kids. Here I am with the fourth grade class that was the driving force behind the horseshoe crab drive. We're all doing the horseshoe crab sign -- another thing they taught me. I don’t have kids at Rhodes School (my kids are grown up), and I wouldn’t have known anything about this horseshoe crab love if my neighbors hadn’t knocked on my door the other day, just as I was sitting down to supper. “We have news!” they announced. It seems they were out on their evening walk when they noticed a crowd of kids and grown-ups headed towards the little cove near our home. They were carrying what looked like butterfly nets, and my friends, who are both curious and the opposite of shy, asked what they were doing. When they found out that they were fourth graders looking for horseshoe crabs, my friends told them they should read Crab Moon. Well, it turns out they had been reading Crab Moon. But they had no idea that the author lived right there. “You need to go to the Cove right now and introduce yourself,” my friends told me. 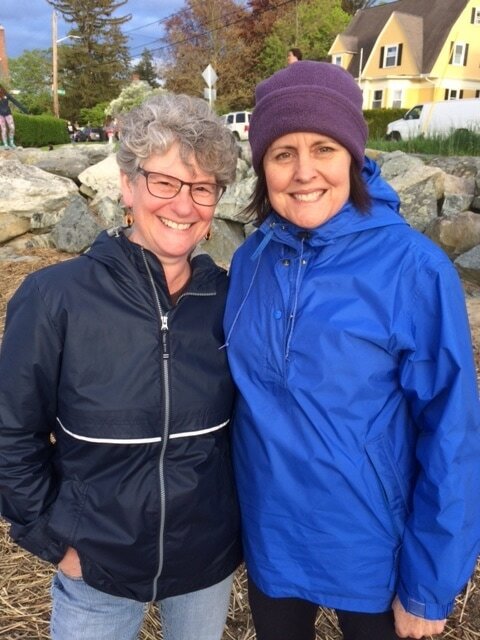 Here I am with Susan Weber, the teacher behind Rhode School’s horseshoe crab craze. We only talked for about fifteen minutes, but as you can see from the picture, we feel like we’ve known each other for years. I’m looking forward to visiting Rhodes School in the fall, when they officially adopt the horseshoe crab as their mascot. And I am immensely grateful that teachers like Weber are out there, inspiring kids to care about the world beyond the classroom walls. By the way, there weren’t any horseshoe crabs in the cove the other night. But they should be showing up there soon. I’ll be keeping an eye out, as I do every year. And I’m guessing that this year I won’t be the only one. 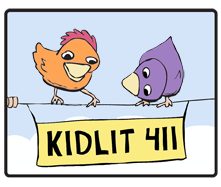 ​ Many thanks to the folks at Kidlit411 for putting me in the Spotlight! You can click here to read a little interview I did. And if you visit the site before April 20, you can enter a chance to win a freed copy of Are We Still Friends?! Flying High at the Flying Pig! I'm still flying high from an amazing event in Vermont, my old stomping grounds. I have a lot to say about it, and haven't had a chance to put my thoughts into words. 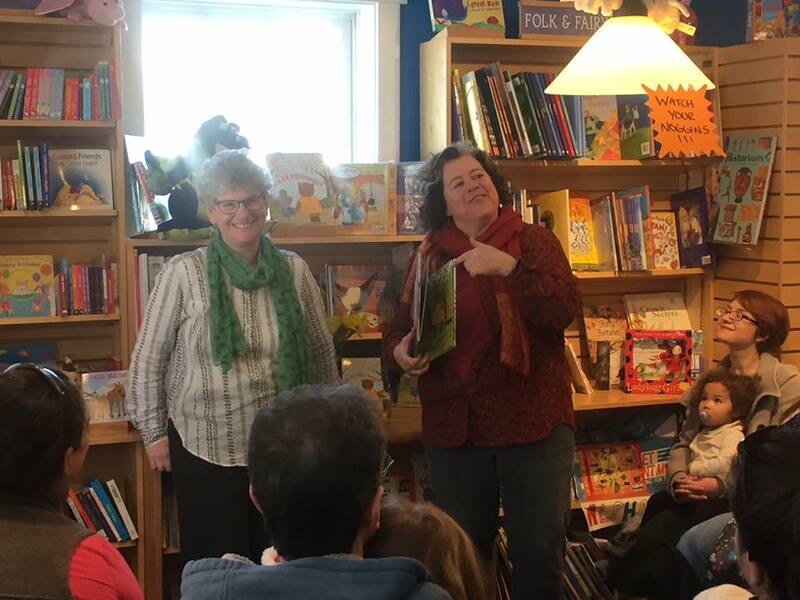 But look at this sweet write-up by Elizabeth Bluemle, children's author and book store owner extraordinaire! My heart is full. Are We Still Friends? gets Tooned! Well, this is adorable. 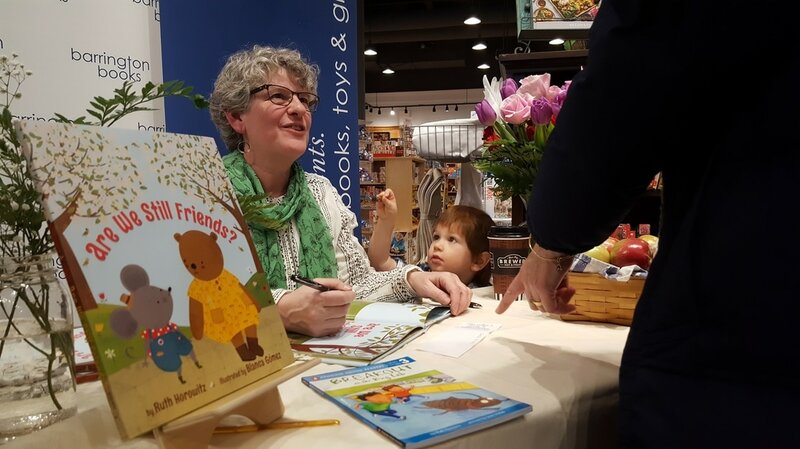 Thank you, School Library Journal and Travis Jonker! I'm counting down the days until this baby's birthday! Are We Still Friends releases to the world on February 28, and I've got two events lined up to celebrate. ﻿More reviews for ARE WE STILL FRIENDS? Here's what Booklist has to say about ARE WE STILL FRIENDS? 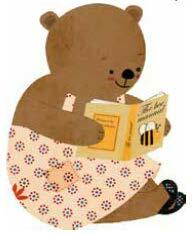 Four months until publication...our first review! Here's what Kirkus Reviews had to say about ARE WE STILL FRIENDS?